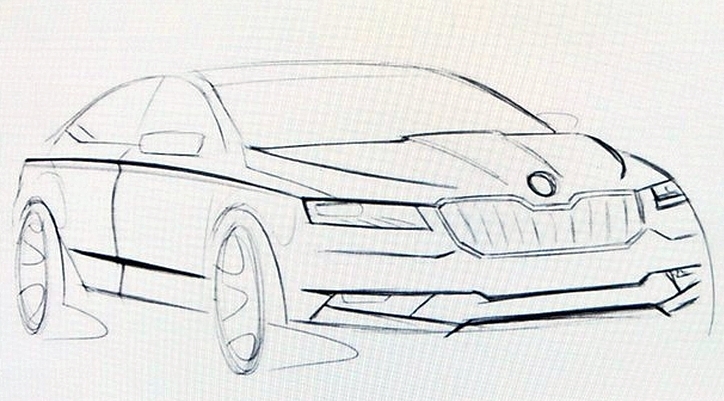 Skoda’s big sedan, the Superb, is long overdue for a complete design overhaul. The second gen Superb will be replaced in 2016 and what we see below are probably the first sketches of the next gen Superb. It will be based on the Vision C concept which was showcased this year at the Geneva Motor Show. The car has a very butch looking hood and a typical Skoda grille. The swept back headlamps are also a part of the Skoda “family look” and are similar to the new Octavia. The new Superb will be built on the famous MQB platform and will share parts with the VW Passat. The car will also incorporate many new materials into manufacturing and employ clever idea to reduce its weight. As far as the engines go, our favorite and the exceptionally bright V6 engine will not be offered with the new Superb anymore. Skoda discontinued the engine in India when it updated the saloon this year. The V6 will be replaced by 2000cc turbo engine which will produce 280 hp and will be mated to a DSG gearbox. Apart from this a 1.8 litre petrol engine will also be on offer. The Superb was Skoda bread winner in developing countries and help make the brand well known across many parts of the world. In India, the Superb faces competition from its sibling, the VW Passat and the Toyota Camry. Skoda easily edged out these cars with the launch of the Superb many years ago and it still continues to rule the roost in this segment. The Superb was updated recently and has again hit the sweet spot with the buyers in the segment as the sales rise steadily with each passing month. Stay tuned to AutoColumn for updates on the Skoda Superb.